COOLSHIRT Systems introduces its Industrial Kit. 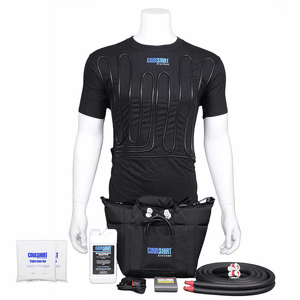 This complete kit comes with the Portable 6qt MOBILECOOL ice based cooling system, a black cotton COOLSHIRT, a rechargeable 7 hr. lithium battery with charger, a 4 ft. insulated hose, our endurance ice, and maintenance solution. The garment covers 30-40% of the body with cold water circulating through tubing designed to dissipate heat away from the body, in-turn, cooling the core. The perfect solution for any industrial worker in a hot environment, you'll reduce fatigue, improves focus, performance and most importantly-SAFETY. 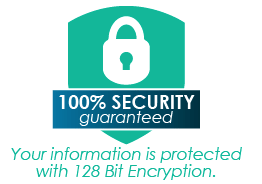 We have partnered with COOLSHIRT Systems to introduce special full systems. This is everything you need! The Active Aqua Vest contains approximately 50 feet of industrial grade capillary tubing securely stitched on the front and back of the vest. It is connected to a compact cooling unit via insulated hose with quick, dry disconnects (sold separately). The cooling unit contains ice, water and an internal pump that supplies cool water to the vest as it covers up to 40% of the body. Heat stress and illness can be very dangerous and even deadly. In an effort to combat this and to help people concentrate and operate safely in hot environments in 1987 Shafer Enterprises invented the Cool Shirt. They have since been used by everybody from race car driver to picnickers. If you need to cool-off at work, on the track, on the field or just whilst gardening, Cool Shirt will have a solution for you. The Water Shirts work by circulating cool water through non-kink tubing around the wearer's body. As this water moves through the system it takes the heat away from the body cooling you down. This water then flows back through the System Unit to a reserve of ice cold water. The circulating water automatically cools before being re-circulated around the shirt, vest or pants. As well as their popular Water Shirts they also Cool Shirt also have a range of CO2 powered vests. There is a Cool Shirt System available for any situation. 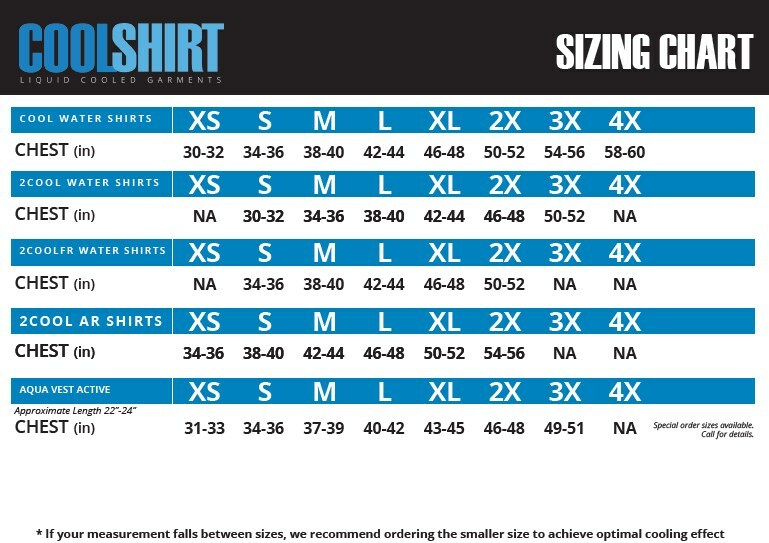 Alternatively look at the Full Personal and Rehab Systems section for ready-made full Cool Shirt Systems. Who are cooling vests for? At The Warming Store we have cooling vests available for a range of activities and uses. We have 3 styles of cooling vests which work in different ways to help you keep your cool. These use the natural effect of evaporation to cool you down. When these vests are placed into water the specially made non-toxic material absorbs hundreds of times its weight in water. This stored water is then slowly released. In hot areas this water will start to evaporate. As it does it the heat from the wearer is transferred into the air helping to reduce your temperature. Easy to use throughout the day. If it dries out all you have to do is submerge in to water for hours more cooling. No electricity is required making them perfect for people on the move. The most affordable form of cooling vest. These non-toxic vests have a large pocket front and back in which a refrigerated, frozen, water or air conditioned cooled pack can be inserted. This flexible cooled pack will then help reduce the wearers' temperature for up to 4 hours. These inserts can be refrozen as and when necessary. Each vest comes with one set of packs. For all day cooling we suggest ordering extra packs which can be kept in a freezer or cooler until it is necessary to exchange them. Each cool pack can be reused. Typically provides a cooler temperature than evaporative cooling vests. These are the most advanced and the coolest of the cooling vests. Based on technology developed by NASA, these shirts work by circulating cool water through non-kink tubing around the wearer’s body. As this water moves through the system it takes the heat away from the body cooling you down. This water then flows back through the System Unit to a reserve of ice cold water. The circulating water automatically cools before being re-circulated around the vest. Come in different power options including 12v, battery and standard outlet. Provide a cooler temperature than both evaporative and phase changing cooling vests.